(Newser) – The head of the Centers for Medicare and Medicaid Services, the body in charge of HealthCare.gov, offered the administration's first formal apology for the site during testimony in Congress. "To the millions who have tried to use HealthCare.gov, we want to apologize to you," Marilyn Tavenner said today, per CBS News. "This initial experience has not lived up to our expectations, or the expectations of the American people, and it is not acceptable." But "it is important to note that the Affordable Care Act is more than just a website." 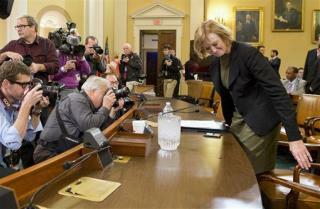 Her testimony opened hearings by the House Ways and Means Committee on the site's rollout. Tavenner addressed concerns that many are losing their coverage because of the health law. "These individuals in a small group, our individual markets, had no protections" prior to ObamaCare, she said, via CNN. They "can call the call center today, and we can help them," she noted. Committee members, meanwhile, voiced concerns about the law and the site. "These problems can’t be fixed through a tech surge, and they’re not just a glitch in someone’s health care coverage," said Republican chair Dave Camp. Camp said he worried low enrollment would boost premiums; Tavenner said the administration expected to see a fairly small figure in mid-November, but said she expected boosts in December and March. Citing healthy market competition, she said, "So far what we've seen is the absolute opposite of what you're suggesting." It was not President Obama's fault when he promised that under ObamaCare, if you like your healthcare plan and your doctor, you can keep your health care plan and doctor PERIOD. The White House will release a statement tomorrow saying that the teleprompter that President Obama was reading from when he made those promises had a glitch, and was displaying incorrect information. The individual responsible for the President's teleprompter maintenance has been fired, and the President apologizes for the misinformation and any hardships it may have caused or will cause in the future. See: http://townhall.com/tipsheet/katiepavlich/2013/10/29/jay-carney-were-only-talking-about-five-percent-of-people-losing-their-health-plans-n1733027?utm_source=TopBreakingNewsCarousel&utm_medium=story&utm_campaign=BreakingNewsCarousel for more of this regimes excuses. No wonder Europe's health system is better than America's health system. Sighing!